Three versions of this map are available, showing how the area developed across the years. They cover West Hartlepool - the new town created by Ward Jackson in the the mid 19th century as a major shipbuilding and coal shipping port. The town developed from the old hamlet of New Stranton. Coverage stretches from Bengal Street eastward to the coast and from Middleton and Central Dock southward to Musgrave Street. The early 1857 edition shows the town developing around Christ Church and Church Street. Features include Middleton, Jackson Dock, Timber Dock, many coal drops, Harbour Terrace, Albert Square, station (on Mainsforth Terrace), West Harbour, New Road, gasworks. There is very little development west of Stockton Street. Surveyed in 1857, the map was updated to 1873. Exctracts from an early trade directory are included. By the 1894 edition development had spread further west and features include Town Hall, York Road area, St Josephs RC church, station (on present site), goods station, Swainson Dock, more timber ponds, graving docks, engine shed, more railways and development around the docks. The 1914 version is even more built up and includes St Oswald's church, Victoria football ground, Union Dock, tramways. Extracts from a contemnporary street directory, including Jackson Street, Middleton Road, Stockton Street, Tower Street, Victoria Road are included. 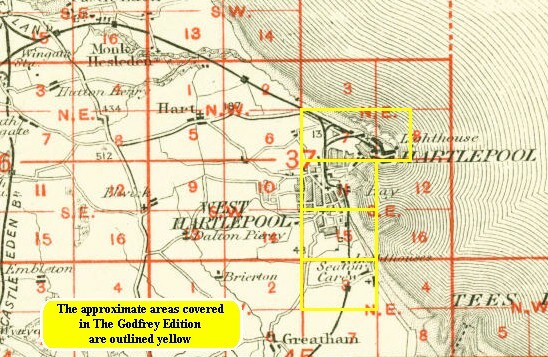 The map links up with Sheet 37.07 Hartlepool to the north and Stranton to the south. Follow this link for a complete list of our Hartlepool area maps.